Egyptian mummies are perhaps the most iconic objects from the ancient world. The tradition of mummification persisted for thousands of years, using processes and materials which changed geographically and through time. Much is now known of both the mummification process and the mummies themselves, partly due to the application of modern imaging techniques, often derived from medical imaging . Our interest here, however, is in the cartonnage cases, panels and masks used to cover the mummified and wrapped body. Cartonnage is a composite material made up of layers of various materials, such as linen and papyrus which were covered with plaster that was often brightly painted . By the Ptolemaic Period (323-30BCE), it was becoming common to make cartonnage from old inscribed papyrus sheet and rolls that were frequently cut and moulded to support the painted plaster. The manufacturing process used sections of papyrus in such a way that they are relatively well preserved and now form a rich source of manuscripts from this period. The discovery that mummy cartonnage could contain writing dates back to the earliest years of papyrology and Egyptology. The first person to have retrieved papyri from mummy cartonnage seems to have been the French archaeologist Jean Antoine Letronne c1825CE who was disappointed by their poor state of preservation and administrative contents . In the early twentieth century, British papyrologists Grenfell and Hunt also realized that mummy cartonnage could contain recycled material and discovered, by chance, that discarded papyri had been used as part of the wrappings of crocodile mummies . Accessing the textual content of these recycled papyrus sheets and rolls is challenging and, although methods have improved in recent years, there is a consensus that all have been invasive to some extent . Indeed, a number of controversial techniques have been used. Private owners of cartonnage of uncertain provenance have dissolved mummy masks and other cartonnage in water and soap to access papyri. The circulation of online videos, where these achievements were publicised without any respect for the many issues connected with this practice, has been condemned by the scientific community [6–10]. This phenomenon raises many concerns not only for the destructive methods employed, but also for the message it conveys to private owners and dealers, who may be attracted to destroy cultural heritage objects for their own aims. The dismounting of cartonnage causes the loss of material cultural evidence, even when performed through appropriate techniques and fully documented. Our contribution to this debate is to investigate the potential for modern non-destructive imaging techniques to identify, characterise and potentially enable the writing on papyrus which is beneath the surface of the object and invisible to the naked eye to be read. This research will inform the debate, publicise the damage caused by destructive techniques, assist conservators, and ultimately avoid the need for destructive analysis of these objects. To image writing in cartonnage successfully, an imaging technique needs to penetrate multiple layers of papyrus which may have been secured using adhesives, covered with plaster and contain air gaps. The technique must then detect paints in the form of dyes (which dissolve in water, are usually organic and adhere to the substrate) and pigments (which retain their particulate form and may be insoluble in water, but require a binder for surface adhesion), both of which may change characteristics over time . Imaging techniques were selected that were expected to give contrast to either organic or inorganic pigments underneath layers of papyrus. Eight different imaging approaches were used, taken from optical imaging, X-ray imaging and terahertz imaging. The assessment of this wide range of imaging modalities presented here begins by using surrogate papyrus “phantoms” which provide a test platform that is more controlled and well characterised than original cartonnage. The use of well controlled test samples to characterise a system is standard practice in chemistry and the analytical sciences, and the use of digital and physical test phantoms for image characterisation is widespread in medical imaging [12, 13]. While both have been used in heritage science [14, 15], the method is not widespread, perhaps because of the approach that all heritage objects should be seen as individual and unique. However, the same is true of patients in medical imaging. The purpose of a phantom is not to reproduce all aspects of the object being examined, but to provide a simplified, reproducible and well understood object of low value whose characteristics are known and so can be used to compare and validate results objectively and safely. In this case, a simplified test object also allows the fundamental characteristics which are common to all cartonnage of interest—papyrus and ink—to be extracted from the complexities of adhesives, plaster, paint, and changes which occur over time, thereby allowing contributions from different variables to be assessed individually. Moreover, modern phantoms can be imaged and handled repeatedly without risk of damage, and can be shipped internationally without needing to deal with import restrictions. Such restrictions on shipping ancient artefacts, especially those closely associated with human remains, are complex, vary between jurisdictions and change over time. These advantages of using phantoms, it transpired, were critical to the success of the project. The phantoms were designed to isolate the challenges of imaging inks within papyrus by reproducing important features but avoiding the additional complexities of plaster, overlapping layers of text, damage, and other confounding factors. This allowed the characteristics of different imaging techniques to be determined under ideal conditions. Although these ideal conditions may never arise in historical artefacts, phantoms can inform the interpretation and selection of different imaging modalities. Four phantoms were constructed (Fig. 1), each made from four 10 cm × 15 cm sheets of modern papyrus. The sheets were handmade using traditional methods without modern binders or adhesives and had two layers of papyrus pith per sheet (“genuine papyrus” from greatart.co.uk). Each sheet was marked with a cross on one of four quadrants: the four crosses being under zero, one, two and three sheets of papyrus, respectively. A different ink was used to prepare each phantom. Three were selected to be representative of those used historically (carbon ink1 and red iron oxide2 ink being most common, and to a lesser extent, iron gall ink3) and one a modern carbon-based India ink (Winsor and Newton, UK) to provide a well-characterised, reproducible control sample. The inks were applied using a modern ink pen, as a traditional reed pen was found to give lines of inconsistent thickness. The ink mainly lay on the surface of each sheet, with minimal noticeable penetration into the papyrus. To avoid confounding factors arising from the use of adhesive, the papyrus sheets were not glued together but stitched into a flat composite. A single sheet was measured to be 0.33 ± 0.04 mm thick, and the composite phantoms all had similar thicknesses of 1.1 ± 0.1, 1.2 ± 0.1, 1.3 ± 0.1 and 1.2 ± 0.1 mm for the phantoms with iron gall, carbon, red iron oxide and Indian ink, respectively. This suggests that, even though the phantoms were not glued, any air gap existing between the sheets was very small. The phantoms were stored in resin frames to protect them and keep them flat, but were removed from the frames before being imaged using a range of modalities, as described below. Multispectral imaging is an extension of standard digital photography whereby an object is illuminated sequentially under different wavelengths from ultraviolet to near infrared and photographed [15–17]. Blue and ultraviolet light may excite fluorescence of inks or substrates, so filters are used to exclude the illumination light, enhancing the fluorescent signal. The multispectral imaging system used at UCL (R B Toth Associates, USA) is based around a PhaseOne IQ260 60 megapixel, 16 bit achromatic digital camera back and iXR body, and a 120 mm Schneider f/4 achromatic macro lens. Two lighting panels (Equipoise Imaging LLC, USA) contain LEDs which emit light at 12 wavelengths from 370 to 940 nm, and long pass filters can be used to image fluorescence by excluding the illuminating light from capture by the camera. Light in this wavelength range is widely used in heritage applications as it can be detected with a silicon sensor, allowing high resolution imaging with consumer devices. The system is controlled using Spectral XV software (Equipoise Imaging LLC, USA). Phantoms were imaged using 12 wavelengths without filters, and four with filters applied. “Flat field” images were also acquired of a sheet of uniform white photographic print paper to characterise the uniformity of illumination and distortions within the camera such as vignetting. All images were divided by the flat fields prior to subsequent analysis. Analysis involved examination of an image at a single wavelength, taking the ratio of images at different wavelengths, and more sophisticated methods like principal component analysis (PCA: a linear transformation of the images which provides a new set of images which often emphasise differences between the original images) . Transillumination is a specific type of multispectral imaging. In the previous application of multispectral imaging described above, the illumination and detection occur on the same side of the object, in what may be referred to as a “reflection” mode. The effective depth of penetration is therefore limited because even if light does penetrate deep into the object, once it returns to the surface to be detected, it tends to be overwhelmed by the accumulated reflections from all shallower regions traversed by the light. Transillumination or backlighting helps to mitigate against this by illuminating from the reverse of the object and detecting only light which has passed through it. This approach is commonly used in conjunction with multispectral imaging when analysing documents, and has had particular success when examining watermarks . A bespoke illuminator containing an array of 28 white LEDs (LUMEX SLX-LX5093UWC/C, Farnell, UK) was used with the PhaseOne camera system described above. Filters were used to allow some limited assessment of wavelength dependence. Optical coherence tomography (OCT) is a photonic imaging technique predominantly used in ophthalmology . It compares near infrared light that has scattered back from different depths in a sample to a reference signal in an interferometric approach which can provide micrometre resolution to a depth of approximately 1–2 mm in tissue. It is becoming increasingly common in heritage applications , particularly when looking for underdrawings [22, 23]. Two spectral domain OCT systems were used in this work: an Envisu R2200 system (Bioptigen, USA) at Duke University Eye Centre with a central wavelength of 840 nm and a Telestro system (Thorlabs, USA) at UCL, centred at 1300 nm. X-ray micro computed tomography (XMT) provides high resolution images of the spatial distribution of X-ray attenuation within a medium. The phantoms were imaged using a high-contrast time-delay integration XMT system developed in-house and based around a chassis and source supplied by X-Tek (now Nikon Metrology, UK) at Queen Mary University of London. An X-ray tube potential of 40 kVp was used with a tungsten target and a 0.5 mm aluminium filter with a 5 μm focal spot size. The detector is a 16 megapixel CCD camera (Spectral Instruments, USA) coupled with fibre optics to a CsI scintillator (Applied Scintillation Technologies, UK). Previously, the system has been used to image heritage objects such as burnt parchment manuscript rolls  and historical film footage . The phantoms were separated by plastazote LD-45 foam sheets and gently curved in a plastic holder. This approach allowed all four phantoms to be imaged simultaneously. In this set-up, the source and detector remain fixed and the sample rotates. When X-rays interact with a medium, X-rays may be emitted at a lower energy characteristic of the elemental composition of the object: a process known as X-ray fluorescence (XRF). This approach has commonly been used for analysing the composition of heritage objects [26–28]. Two different systems for measuring X-ray fluorescence were used: (1) synchrotron rapid scanning (SRS) XRF imaging using a monochromatic incident X-ray energy of 13.5 keV at the Stanford Synchrotron Radiation Lightsource (SSRL, Stanford University, USA); and (2) handheld portable pXRF using an Olympus Delta Premium XRF analyser which emits at energies up to 40 keV. The former was operated in a high-resolution scanning mode and the latter gave spot measurements. The pXRF system was held in a clamp stand over the phantom which sat on a 30 cm box of expanded polystyrene. This ensured that the system was sufficiently far from any background material that the signal could be assumed to result from the papyrus phantom itself. Conventional X-ray techniques are sensitive to the X-ray attenuation of a medium, but materials such as papyrus have low attenuation, so contrast is low. Phase contrast X-ray generates images of the refraction of X-rays as they pass through a medium and therefore offers an alternative contrast mechanism. These methods usually require monochromatic, collimated beams from synchrotrons and have been used for cultural heritage, most famously for imaging the Herculaneum papyri scrolls [29, 30]. However, a laboratory-based edge-illumination X-ray phase contrast system at UCL operating at 25 mA current and 40 kVp voltage was used in this application . Although a lab-based system is more suitable for delicate heritage artefacts, it should be noted that this system had been built for research into medical imaging applications and improved performance would be expected from a system optimised specifically for imaging cartonnage. The field of view is ~ 2 cm × 5 cm and multiple images, showing parameters such as X-ray absorption, refraction and scatter width are obtained [32, 33]. Terahertz frequencies (0.1–10 THz, or equivalently, wavelengths of 0.03–3 mm) lie between infrared and microwave radiation. The photon energy at 1 THz is very low, 4.14 meV, meaning that terahertz radiation is non-ionising. This radiation mainly interacts with the intermolecular chemical bonds, so provides image contrast depending on the chemical composition of the materials present. This technique is beginning to be applied in heritage science [34, 35]. The phantoms were imaged with a TeraPulse4000 system (Teraview Ltd, Cambridge, UK) at the University of Western Australia. The pulses of THz are generated in this system by the excitation of a low temperature grown GaAs wafer with a gold deposited bow-tie antenna with a 780 nm near infrared laser with a pulse width ~ 100 fs. The image is formed by raster scanning the beam across the sample in x and y directions. This is a time-domain imaging system, in which each pixel contains the reflected THz pulse signal (amplitude and phase). Thus a three dimensional dataset (x,y,t) is obtained where the third dimension is time which, if the structure and refractive index of the sample are known, can be converted into depth. A reference measurement is acquired from an optically flat metallic mirror, and is deconvolved from the sample pulse prior to further analysis of the signal. The test phantoms, mounted either in resin frames or within the pages of a book for protection during transport, were successfully imaged using multiple modalities in laboratories across three continents. Despite repeated handling, transport and imaging sessions, images of the phantoms taken at UCL at the start and end of the project (Nov 2015–Mar 2017) were indistinguishable by eye from each other, suggesting that the properties of the phantoms had not changed substantially during the 18 months or so of the study. In more detailed analysis, the mean difference in the measured intensity across all pixels in images acquired on the same day (in an area selected to avoid edges, thread or ink) was ~ 0.3%. This was taken to be an estimate of the test–retest reproducibility of the system. Multispectral images of the four phantoms were acquired at the beginning and end of the project, 18 months apart. They were aligned by registration using the Mattes mutual information algorithm [Matlab 2016a (The Mathworks, USA)] and had a mean difference (after registration, and after the lights had been repositioned), of 4.2% (iron gall), 1.1% (carbon ink), 1.0% (red iron oxide ink) and 0.8% (India ink). Differences of ~ 1% were assumed to be due to errors in registration and different lighting conditions. The higher difference occurred to the phantom with crosses in iron gall ink and suggests that there may have been some damage to that phantom during transit or handling. For all phantoms, the greatest penetration was seen with the longest wavelength, 940 nm (shown in Fig. 2). Images processed with PCA (Fig. 3) were unable to demonstrate improved penetration. Similarly, other approaches such as image subtraction were unsuccessful. Unfortunately, measurements of contrast or signal-to-noise ratio were unsatisfactory, as the eye–brain system is guided by the shape of the cross. On a purely quantitative measurement of signal-to-noise ratio, even the second cross, which is clear on visual examination, has a signal which is less than two standard deviations above variations in the background. Multispectral imaging offers excellent spatial resolution and some spectral information for inks on the surface or under one layer of papyrus, but the information content soon diminishes with depth. Images obtained with white light transillumination are shown in Fig. 4. Here, crosses on all four layers are clearly visible, although those in deeper layers are somewhat less clear than those in the top layers. No appreciable difference was observed when filters were used. Transillumination images displayed a large dynamic range (due to absorption by the papyrus, the majority of the images were very dark although the transilluminating light gave very strong responses from pinholes in the phantoms). The images were therefore enhanced using the Auto Equalise function of Gimp 2.8 (http://www.gimp.org), and show the structure of the papyrus as well as the crosses. This transillumination system was not optimised for this application, but gave substantially improved penetration compared to multispectral imaging. Future developments include a bespoke system with adjustable wavelengths which is anticipated to offer similar penetration but enhanced spectral information. OCT images were initially obtained of all four phantoms using a clinical system at Duke University Eye Centre. OCT images show reflections from interfaces within an object as well as light scattered by microscopic structure so, because papyrus is a layered structure, these images were complex and difficult to interpret. Accordingly, further studies were carried out with a more flexible system at UCL. It was found that, unless special care was taken to select part of the phantom where the papyrus sheets happened to be thinner than average, the papyrus attenuated the light and, therefore, the OCT signal so significantly that no convincing detail or structure of the papyrus could be seen. This was investigated further by calculating the attenuation coefficient of papyrus at this wavelength which was found to be approximately 17.5/mm. This is unusually high (compared with ~ 5/mm for skin ) and suggests that the intensity of light would be reduced by half after about 40 μm of papyrus. Equivalently, light passing through a single 300 μm thick sheet of papyrus, then reflecting off an interface and returning, would be expected to be reduced in intensity by a factor of 36,000. At shorter, visible wavelengths, this would be even greater. Images were generated of the uppermost cross in carbon ink, sliced to show the top surface of the phantom, and of the cross under one sheet of papyrus, sliced to show the level at which the cross would be expected (Fig. 5). The uppermost cross was visible, but the cross under one sheet of papyrus was not, suggesting that the attenuation coefficient of papyrus at 1300 nm is far too high to image below even one sheet of papyrus. The top half of all four phantoms, imaged simultaneously, can be seen in a surface rendered XMT image in Fig. 6 with areas of maximum contrast corresponding to the iron-based inks highlighted in red. The physical construction of the phantoms can be seen particularly clearly. Examination of the 3D cross-sectional images showed that the iron ink could be reliably identified, but the carbon ink could not be detected. This suggests that XMT can be used to examine the physical construction of the artefact, and identify heavy metal-based inks, but not carbon-based inks. Spectroscopy measurements were taken from parts of the phantom with the pXRF system where no ink was present and compared to those where ink was visible. Two “modes” were available on the system used, which was on loan from UCL Institute of Archaeology: a “soil” mode and an “alloy” mode. The soil mode was calibrated for calcium as well as most other elements which were expected, so this mode was used throughout. The crosses corresponding to India ink and carbon ink were not detected. Both rely on carbon, which is a light element (atomic number Z = 6) and fluoresces at too low an energy for this system to detect. The lightest element which could be detected was phosphorus (Z = 15). The iron present in iron gall ink and red iron ink (Z = 26) was readily visible and could be distinguished from background through up to six layers of papyrus (additional layers of plain papyrus were placed above the phantom). Each additional layer of papyrus reduced the intensity of the fluorescence from iron by a factor of approximately 1.7 (Fig. 7). X-ray fluorescence imaging was carried out at SSRL. The beam was scanned across the phantoms and the emitted fluorescence measured with an energy-resolving detector. The energy region of the Kα fluorescence line for each element of interest was identified, and the spatial distribution of the emitted X-ray intensity in this energy band was plotted as an image. Figure 8 shows the images corresponding to iron for the four phantoms. The images of the iron-based inks show all crosses with similar contrast, indicating that the Kα fluorescence of iron was successfully identified in the ink at all depths. Crosses on the deeper layers were visibly less intense due to attenuation within the phantom. Images of the carbon based ink show little signal corresponding to iron, as expected, although a faint cross can be seen on the top left (only half of the phantom was scanned due to time restrictions). Carbon Kα fluorescence is low energy (0.277 keV) and so is severely attenuated by absorption in air. The rapid scanning synchrotron system used here was, therefore, unable to resolve carbon in this geometry for several reasons: (1) the low X-ray fluorescence energy of carbon, (2) the detection limit of the detector used, and (3) the fact that the substrate is predominantly carbon. However, images of the carbon ink crosses were able to be resolved by imaging other elements. Weaker signals were seen from Ca, Ti, Mn, Ni, Cu, Zn, Ga and As due to impurities in the dyes but, surprisingly, there was a very strong signal from bromine in the India ink phantoms. This may be due to an additive in the ink, most likely the cationic surfactant cetyltrimethylammonium bromide (C16H33(CH3)3N+Br−) . XRF can detect heavy metals through a substantial thickness of papyrus. 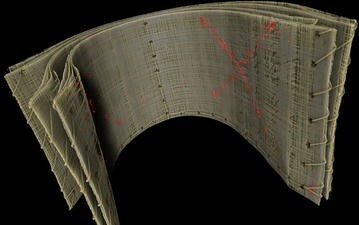 The pXRF system used here could detect iron-based inks through six sheets of papyrus but a more sensitive synchrotron-based system would be expected to show greater penetration still. The range of specific approaches which are available (from a hand-held system to a synchrotron) mean this is a flexible method. Due to time constraints, only the phantoms with crosses in red iron oxide and carbon were examined using X-ray phase contrast imaging. The small field of view (~ 2 cm × 5 cm) meant that only selected parts of the phantoms were imaged and images showing part of the red iron oxide cross on the surface of the phantom are shown in Fig. 9a, b. The cross appeared strongest on the absorption image due to the attenuation of the iron in the ink. This image also clearly showed the fibrous structure of the papyrus (Fig. 9a). The cross was also visible in an image of scatter width (Fig. 9b), which was attributed to the refractive index of the ink differing from that of the papyrus. Some faint traces of contrast were seen from the carbon ink, but these were very faint and do not reproduce well. The laboratory-based X-ray phase contrast system used here was able to detect the iron inks and the structure of the papyrus. Moreover, there was some evidence that the carbon inks could be seen due to the change in refractive index. However, more assessment is needed to optimise the approach. 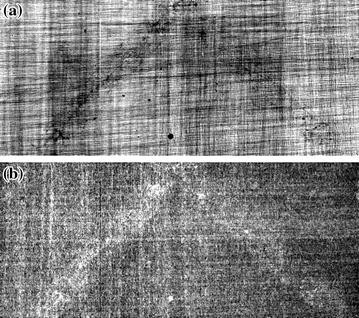 Figure 10a shows THz images of the carbon ink at all four depths, demonstrating that ink on all four layers could be detected. A similar result was seen for the India ink cross, though this was less distinct. The iron-based inks were barely visible (Fig. 10b). All four samples were scanned with a spatial resolution of 500 μm however, the maximum resolution, which is diffraction-limited, is around 100 μm. The images shown in Fig. 10b are the peak to peak signal of the reflection from the first layer of each papyrus sample. THz was able to penetrate multiple layers and was the only method which appeared to give better contrast for carbon-based inks than for iron-based inks. The different imagingρ techniques all brought different advantages and disadvantages, so should be seen as complementing each other. Multispectral imaging provides excellent surface detail of both iron- and carbon-based inks with high spatial resolution, but limited penetration. However, this disadvantage is to some extent mitigated by the use of transmission imaging. Optical coherence tomography offered unexpectedly poor penetration due to the high optical attenuation coefficient of papyrus. The X-ray techniques were able to identify iron-based inks even when additional sheets of papyrus were added on top of the phantoms, but were unable to detect carbon-based inks. In particular, XMT provided exquisite images of the internal structure of the material. Furthermore, improved performance of X-ray phase contrast imaging would be expected if the system was optimised for this application. In particular, it would be interesting to see whether the scatter width image could show a signal from the carbon-based inks. An pXRF system optimised for the geometry and elements expected in cartonnage is likely to form a convenient and low-cost part of a multimodal approach. Terahertz imaging was, somewhat to our surprise, more able to detect carbon-based inks than iron-based inks. It is encouraging that THz appears to be sensitive to inks which are not visible with X-ray techniques. These results are supported by a previous THz study which was also able to read carbon inks on papyrus . Despite the different modalities being complementary, there are clear applications where certain modalities are likely to be preferred. For example, XMT should be used when the internal structure of cartonnage is required while multispectral imaging is recommended when only surface detail is of interest. However, a full examination of a complex piece of cartonnage is likely to require a multimodal approach, where each technique provides complementary information. This could place a significant barrier in the way of researchers in the cultural heritage sector who might not have access to a wide range of imaging techniques. In addition, given the different geometries and fields of view of the different techniques, a successful multimodal imaging approach will require sophisticated image registration to ensure that features on the different images are spatially aligned. If an existing instrument which was designed for some other application is repurposed for imaging heritage artefacts, its performance cannot be expected to be optimal. In particular, transillumination, phase contrast X-ray and THz imaging would be expected to give improved images if the instrumentation, acquisition or processing were optimised. Finally, the use of simple, predictable, test phantoms has allowed different imaging modalities to be objectively compared. This will inform future studies in which cartonnage will be imaged. It would have been challenging to carry out a speculative study such as this on original material, particularly across multiple institutions on different continents, due to issues involving the transportation of antiquities, including their fragility, and the legal frameworks that (quite rightly) restrict the sharing of these materials across borders. No current single imaging technique can identify both iron and carbon-based inks at depths within cartonnage. In order to detect and ultimately read text within cartonnage a multimodal imaging approach is required, but this will, necessarily, be limited by cost, access to imaging systems, and the portability of both the system and the cartonnage. The additional challenges of imaging writing within ancient cartonnage compared to the test phantoms include a more complex geometry, overlying structures such as plaster, adhesives and paint, and the presence of mixtures of inks. It will, therefore, be important to begin by imaging the internal structure with XMT, which will assist with the interpretation of other imaging methods. Ideally, a combination of multispectral imaging techniques would then be employed for surface inks or paints, and X-ray fluorescence imaging for deeper iron-based inks (which would not necessarily require a synchrotron). At the moment, there cannot be confidence that deeper carbon-based inks can be detected, although optimised THz systems may allow this in future. An imaging approach based on low-cost and easily accessible methods would be necessary for widespread use in museums and archives. Such an approach might use multispectral imaging and pXRF to identify and clarify text on the surface layers and allow the constituents of inks to be identified. It is noted that there may be barriers to accessing these imaging modalities within the cultural and heritage sector, including associated costs, and building appropriate interdisciplinary networks. Our work leads us to believe that imaging could be used to identify whether text is present within mummy cartonnage. In some circumstances—for example if iron-based ink is near the surface of cartonnage—imaging may even allow the writing to be read, meaning that it may no longer be necessary to destroy these artefacts in order to read any text inside them. Future work will involve multi-modal imaging on actual mummy cartonnage since the use of phantoms has established that our approach is valid and may yield useful results for historians and related researchers, although issues remain regarding the ability of artefacts to travel to available imaging resources. Our work can also give curators and conservators some confidence that multiple complex imaging methods can be carried out safely without damaging the artefacts. The range of techniques used here will not be commonly available to Egyptologists or papyrologists and indicates that interdisciplinary collaboration is essential to be able to utilise available technologies in the understanding of ancient cultural heritage. Carbon ink was made by grinding soot into a fine powder, mixing to a paste with deionised water and then mixing into the binder. Red iron oxide ink was made by grinding red earth (Aswan, Egypt) with a pestle and mortar, making the resulting powder into a paste with deionised water and then mixing in a binder of one part powdered gum Arabic (Kurdufan, Central Sudan) to two parts water. Iron gall ink was made by soaking five oak galls overnight, then crushing them, boiling in deionised water and straining. Iron sulphate II and a dash of white wine were added. A binder of one part powdered gum Arabic (Kurdufan, Central Sudan) to two parts water was used. AG conceived and led the study and wrote the paper. KP designed and made the phantoms and led the multispectral imaging at UCL. MBT and MT were responsible for overall management of the Deep Imaging project4 of which this work forms a part. Other authors are listed alphabetically in the author list and made the following contributions: AG, KP, WCB, CJ, MBT and MT carried out multispectral imaging and analysis; UB, PLM and RAW carried out the rapid-scan XRF imaging at SSRL; GD and DM did the X-ray microCT imaging; SFan, AF and VW did terahertz imaging and analysis; SFarsiu, GL, CMJ and PRTM carried out OCT imaging and analysis; JG, BV and AG did pXRF data collection and analysis; PM, ME and AO carried out phase contrast X-ray imaging and analysis, and RM, KP and AS provided expertise and advice on Egyptology. All authors read and approved the final manuscript. The authors thank Lucy Stagg, Dave Beavan, Daniel Hanlon and James Wilson (UCL) for their help with research data management. We thank Andrew Tindall (UCL) for preparatory work on transillumination imaging, Ruth Siddall and Jo Volley (UCL) for advice on historical inks, pigments and binders and Patrick Quinn (UCL) for the loan of the pXRF system. We also thank the staff of beamline 6-2 at SSRL for help with the rapid-scan XRF imaging and Sanghoon Kim for work on OCT imaging. WCB is a principal of Equipoise Imaging, LLC, who provided the LED illumination, capture software, and camera filtering technologies used in this study. The authors declare that they have no competing interests. The data is freely available and hosted by UCL as part of the Deep Imaging project (http://www.ucl.ac.uk/dh/projects/deepimaging/data). This work was funded by Arcadia, a charitable fund of Lisbet Rausing and Peter Baldwin as part of the “Deep Imaging Mummy Cases: Non-Destructive Analysis of Multi-Layered Papyrus” project.5 Arcadia serves humanity by preserving endangered cultural heritage and ecosystems. Because knowledge should belong to all, Arcadia also promotes open access, seeking to make information available without barriers of cost or distance (see Footnote 5). BV was funded by an EPSRC/UCL Undergraduate Research Summer Studentship and CJ by the EPSRC SEAHA Centre for Doctoral Training. ME was supported by the Royal Academy of Engineering under the RAEng Research Fellowships scheme. Part of this research was carried out at the Stanford Synchrotron Radiation Lightsource (SSRL), a user facility of the U.S. Department of Energy (DOE), Office of Basic Energy Sciences. PLM thanks STFC for their support (ST/M001814/1). Frösén J. Conservation of ancient papyrus materials. Oxf. Handb. Papyrol. Oxford: Oxford University Press; 2009. p. 87–91. http://www.oxfordhandbooks.com/view/10.1093/oxfordhb/9780199843695.001.0001/oxfordhb-9780199843695-e-004. Accessed 28 Sept 2017. Mazza R. New testament papyri from mummy cartonnage: accounts don’t balance. facesandvoices.wordpress.com/. 2014. https://facesandvoices.wordpress.com/2014/05/13/new-testament-papyri-from-mummy-cartonnage-accounts-dont-balance/. Mazza R. Another Indiana Jones? Josh McDowell, mummy cartonnage and biblical papyri. Faces Voices. 2014. https://facesandvoices.wordpress.com/2014/05/05/another-indiana-jones-josh-mcdowell-mummy-cartonnage-and-biblical-papyri/. Accessed 13 July 2017. Jones B. The “First Century” Gospel of Mark, Josh McDowell, and Mummy Masks: What They All Have in Common. http://www.bricecjones.com/1/post/2014/05/the-first-century-gospel-of-mark-josh-mcdowell-and-mummy-masks-what-they-all-have-in-common.html. Accessed 3 July 2017. Ehrman B. New manuscripts and the destruction of antiquities. https://ehrmanblog.org/new-manuscripts-and-the-destruction-of-antiquities/. Accessed 3 July 2017. Barford P. US Christian Apologist Fanatics Destroy Ancient Artefacts. Portable Antiq. Collect. Herit. Issues. http://paul-barford.blogspot.com/2014/05/us-christian-apologist-fanatics-destroy.html. Accessed 3 July 2017. Easton RL, Knox KT, Christens-Barry WA. Multispectral imaging of the Archimedes palimpsest. Appl. Imag. Pattern Recognit. In: Workshop 2003 Proc. 32nd. IEEE; 2003. p. 111–6. http://ieeexplore.ieee.org/abstract/document/1284258/. Accessed 25 Apr 2017. Davis GR, Mills D. Brute force absorption contrast microtomography. In: Stock SR, editor. 2014. p. 92120I. http://proceedings.spiedigitallibrary.org/proceeding.aspx?doi=10.1117/12.2061929. Accessed 28 Sept 2017.